After last week’s spring clean I felt so refreshed and energized, and it is reflected in the fun I have had this week. The highlight of the week has to have been having Jacquie Gering of Tallgrass Prairie Studios talk at the Portland Modern Quilt Guild. I love the freedom of Jacquie’s quilts and am sooo inspired by seeing her quilts in person and hearing her talk. I can not wait to cut my poppy quilt up and try to make something modern and different from it. Stay tuned. 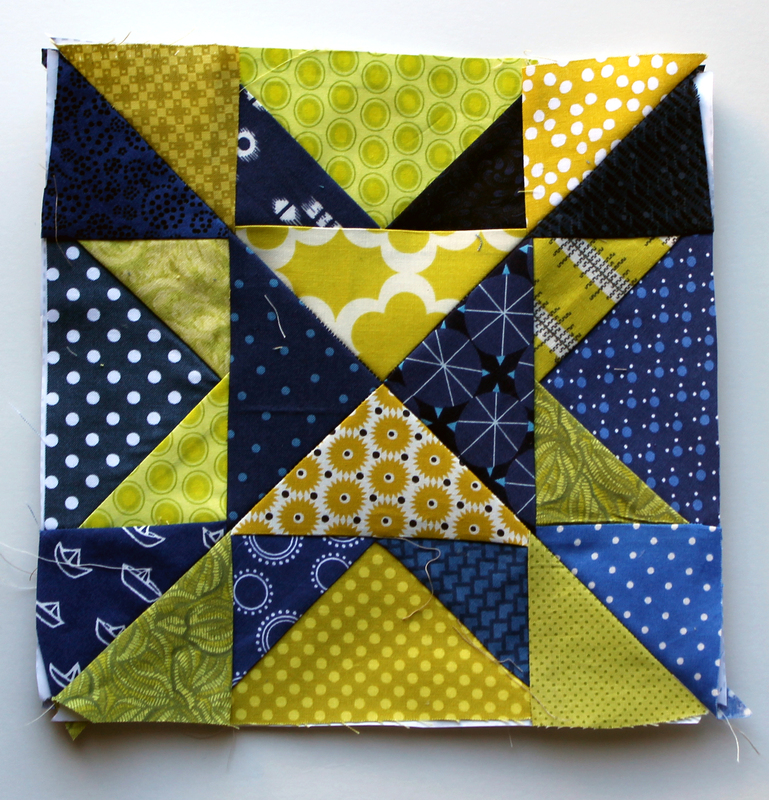 This quilt started a little while ago with this modern Ohio star block (posted here)…. And it grew into this fun bright quilt. Once again with the block you can see the star pattern, but with the quilt you see so much more (mainly lots and lots of triangles!). I struggled for a couple of weeks over the backing of this quilt. I pulled out and prepared a couple of printed fabric choices but nothing seemed to work just right for me. Then I woke up yesterday morning with the perfect solution. I grabbed some solids and little bit of quilters linen and made this backing piece. I decided to quilt along several of the block seams to really highlight the triangles in the pattern. 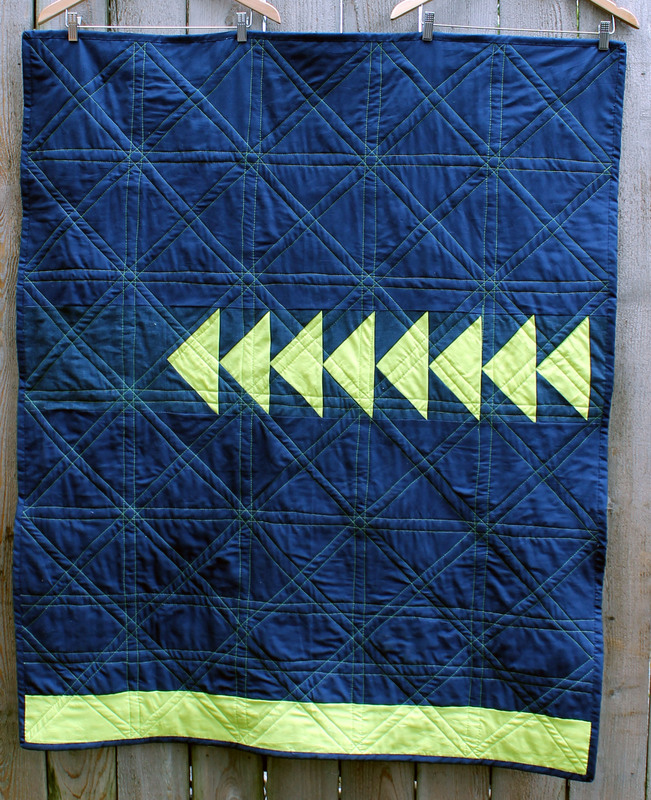 I used lime green thread so that you could really see the quilting on the back. I do not usually do this, but in the spirit of new things, I gave it a try. It does mean that you can see a couple of my not so straight lines but I am embracing the imperfections. 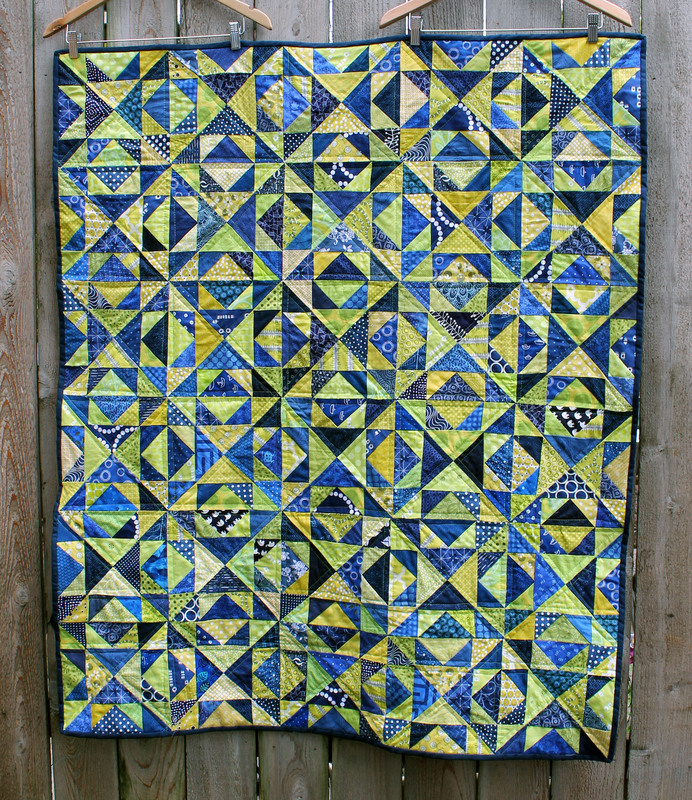 I am entering this quilt in the Bloggers Quilt Festival in the two colour category. 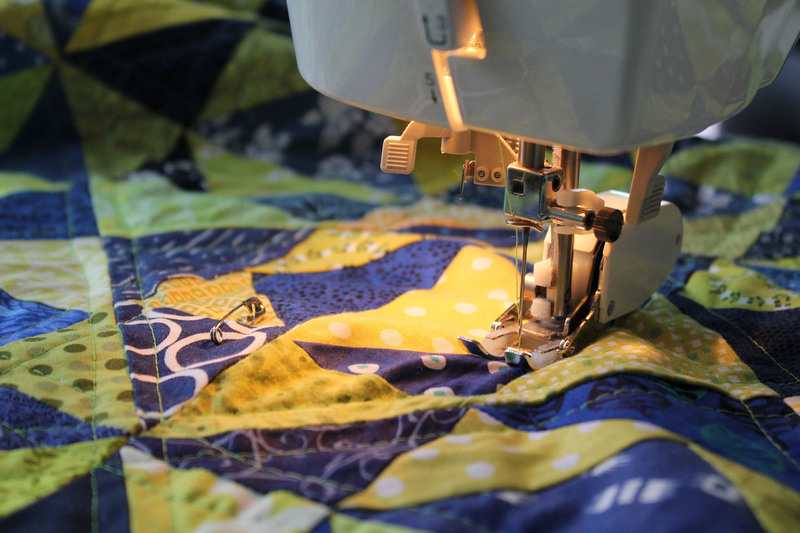 It is the first time I have entered a quilt and the quality of the quilts entered is amazing. Check out the site, in particular their quilters focus, for some amazing inspiration. Now I am off to do some more quilting. I have a stack of quilts that unfortunately are not going to finish themselves… unless someone will lend me some quilting elves! Lovely variety of fabrics and the lime thread works really well on the back. The little stars that form where the stitching crosses are very cute. Thanks. I liked the quilting star too. It looks cute but also helped flatten out some bulky joins. I hate those bits where lots of fabric meets in the pattern and quilting around them ALOT seems to help soften them. I love your style! The blue and the lime are so smart together. And the classic block looks so modern in your fabrics. Good finish. Thanks. I think scraps and bright colors are how I like to modern things up. I am going to try and be a little more adventurist in my modern approach. I hope it works! Sooo wonderful. Love the back, too! Looks fantastic! And what a great idea for the back. I often struggle with the back – mostly solid with a highlight is a great solution. I especially like the lime stripe at the bottom of the back – oh, and the front is righteous pretty, too! Thanks. It is strange that I am so taken with the simple back, but it was such a struggle. I love this! Especially the green thread – perfect. Funny how sometimes you struggle and struggle with something and then the solution comes to you without any apparent effort. Love it! And the back is perfect! When you’re finished with the quilty elves send them my way! Lovely qulit! We would love it if you came and visited and joined our blog! 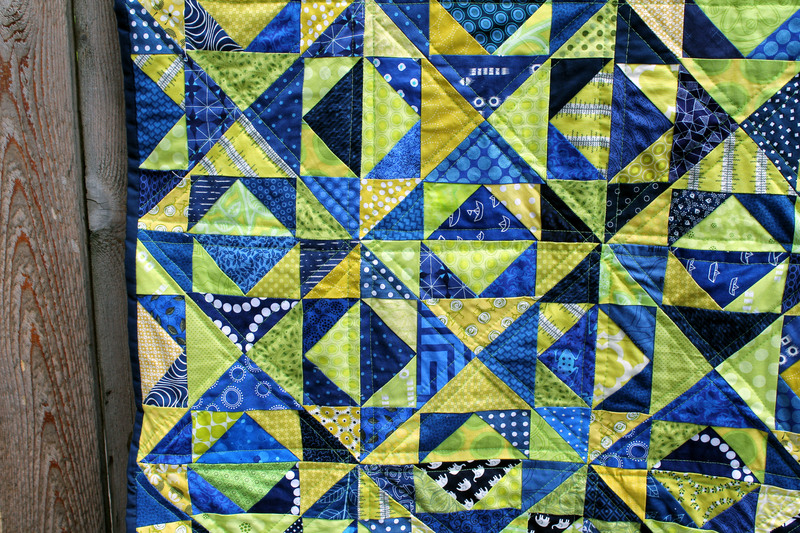 Yay for trying new things – that lime quilting on the back is lovely! Beautiful work. Goodness!! not only do I love those colors – that is a fabulous look!! Great job! Thanks. I kind of like how it all turned out. Ooooh what an awesome quilt! 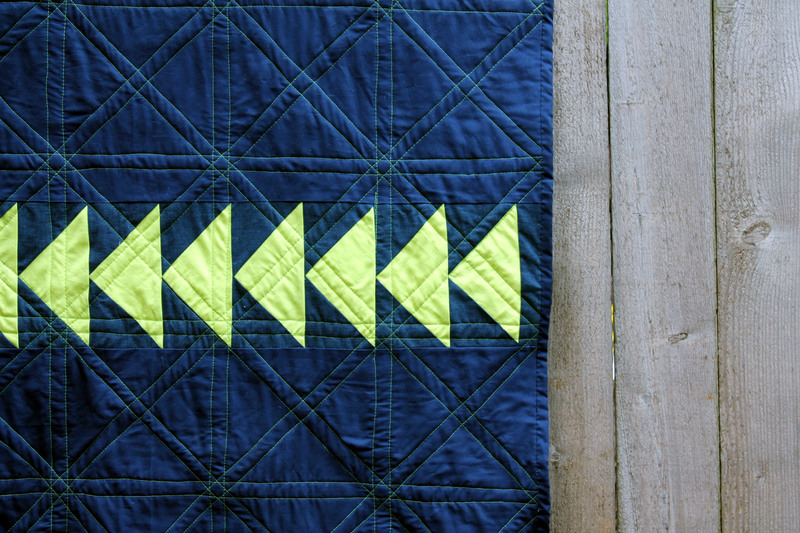 I love all the triangles and the quilting! And those colors are fabulous together. I love the colors in your quilt. What a cool block – and what a neat pattern after joining them together. I’m visiting through TGIFF and will be following from now on! Glad you liked the quilt. I am often surprised how my quilts turn out when all the blocks are sewn together. Sometimes the results are good, sometimes not as good as I envisioned. Great color combination! I love how you continued that onto the back with the piecing and the quilting. the front and back of this quilt are both just beautiful! Thank you. I really liked how the back is such a great reflection of the top.